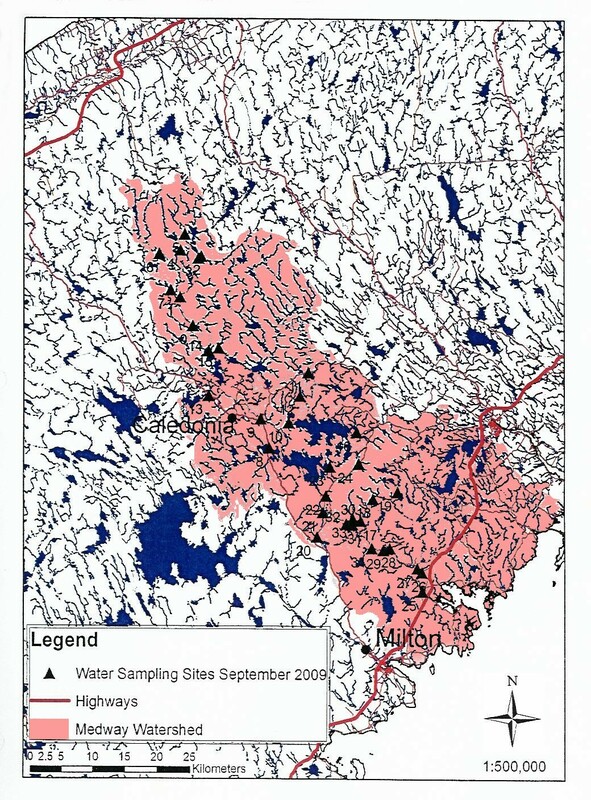 The Medway River catchment encompasses approximately fourteen hundred (1400) square kilometers a large watershed. From Port Medway where the river meets the Atlantic Ocean to its upper reaches at Lake Alma is about eighty (80) kilometers of river including Ponhook Lake (as the crow flies). The river is characterized by being relatively long and more narrow than other river systems. 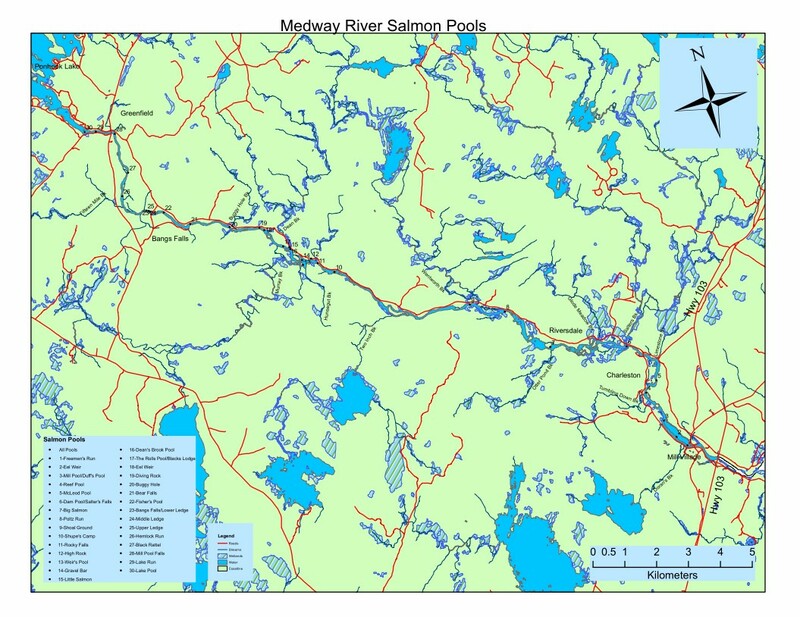 This river system is divided into two (2) main parts in the upper half of the catchment. Alma Lake is the headwater lake of the main river and the Pleasant River system runs into the large Molega Lake before it joins with the main river system just upstream of Ponhook Lake. The Medway River's storied salmon fishing heritage associates with the village of Ponoque which became Greenfield in 1850. Previous to 1883 the only connection the village had with the outside world was via the Medway River or coach from Liverpool. Many sport fishermen began coming to the Medway prior to 1900 and were taken in as boarders by locals. The Maple Leaf Hotel as it was named by Boardman Hunt when purchased around 1900 became a must destination for salmon enthusiasts for many years. In 1926 the Freeman House opened for business and continued the salmon fishing traditions that had become legendary on the Medway. Mr. Lew Freeman spent his whole life on the Medway River. He started at the Freeman House in nineteen hundred twenty six (1926) and stayed until nineteen hundred forty four (1944). The clientele, mostly American, came to fish Atlantic salmon and trout. There were about eighteen (18) to twenty (20) guides involved with the hotel. Over the years, several lodges and cabins were built in the area driven by the great salmon fishing, helping to create a vibrant economy. One cannot mention the Medway River without speaking of Harry Freeman. Harry, a lumberman and a scientist, devoted much of his life to the enhancement of the Medway River and the Greenfield area. He was recognized internationally as a scientist and developed laboratory research methods still in use today, and pioneered in studies of fish health, particularly that of the Atlantic Salmon.